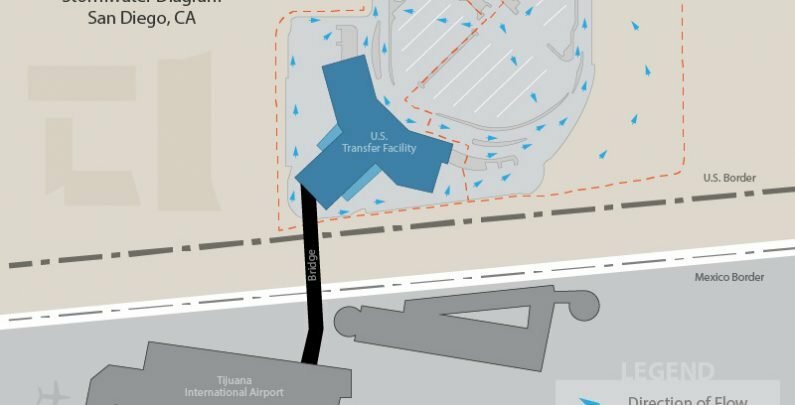 Set to open November 2015, the facility and bridge connecting California’s Otay Mesa to Mexico’s Tijuana International Airport, is a 390 ft. transportation puzzle piece, officially named the “Cross Border Xpress”. This $78 million dollar private investment connects Southern California residents to an additional airport facility, a ‘win’ for San Diego and California commerce. The new access point will relieve current traffic-stress on San Diego International Airport and San Diego’s two conventional vehicle border crossings – San Ysidro & Otay Mesa. “The Cross Border Xpress will serve approximately 2.4 million passengers [annually]”¹, according to a statement from the development company, Otay Tijuana Venture, LLC. Once you’re across, Tijuana is just a 4.5 hour flight to Cancun and even boasts direct flights to China and Japan. “This is a great example of private investment creating much-needed public infrastructure to facilitate safe, secure travel and trade,” said Mark Cafferty, Chief Executive Officer of the San Diego Regional Economic Development Corporation. The U.S. site was originally designed and graded for a typical industrial-business park development. Prior to being acquired as part of the new airport border crossing project, some basic infrastructure, including storm drains and sewage utility lines had already been installed. Therefore the storm drain system had to be designed around these existing lines (locations & depths), increasing the complexity of the system. Civil engineering firm Latitude 33 Planning & Engineering sought efficient, space-saving solutions that would meet stringent stormwater treatment regulations, accommodate existing utilities and treat a large capacity of storm water prior to discharge from the site. Latitude 33’s use of Bio Clean’s products on other challenging sites allowed them to specify the Bio Clean Water Polisher and MWS Linear as dependable and proven options. Since the existing storm drain lines were installed at the very north end of the parking lots, the engineer had the challenge of routing all runoff from the southernmost boundary to the north end via a series of catch basins and ribbon gutters. As a result the storm drain lines would become quite deep. Therefore the stormwater treatment system would need to be underground, installed several feet below finish surface (to intercept the deep storm drains), but still have the capability to treat 85% of the annual stormwater runoff and internally bypass higher flows up to the 100 year storm event. Eventually two Water Polishers were commissioned, one at each end of the site, and each treating between 11 & 12 acres. The first designed to treat 2.29 cfs and the second, 1.52 cfs from multiple catch basins throughout the site. The Bio Clean Water Polisher has been proven through extensive testing to be able to meet the treatment objectives required by the City of San Diego and therefore was approved for use on this project as being both a highly effective and feasible solution. In addition, during a comparison of other options, the Water Polisher was shown to have the lowest maintenance costs of any media filtration system available. Engineering also had to address flow coming off of the main street thoroughfare with systems that could also accommodate existing storm drain lines and avoid trenching, while maximizing space. Latitude 33 and Bio Clean design teams confidently applied the Modular Wetland System Linear (MWS Linear) to solve the site’s challenges. The MWS Linear is an advanced stormwater biofiltration system approved by the Washington State Department of Ecology for General Use Level Designation (GULD) treatment of dissolved metals, total suspended solids and phosphorus. Not only is the MWS Linear a green solution, that most projects now require to help meet low impact development requirements, it’s also accredited as one of the industry’s most efficient treatment systems. The MWS Linear is unique among biofiltration systems. It’s the only biofilter to incorporate a patented horizontal flow² technology while all other biofilters have a downward flow media bed. Downward flow translates to limitations for most systems’ range of depth, but the MWS Linear can be made as shallow as 2’ and as deep as 8’ (without changing performance). This would prove to be a key feature for a site with existing utilities and various pre-existing storm drain depths (both shallow & deep), because in order to complete the Cross Border Xpress site design and meet project requirements, a system would have to work around every existing site constraint. MWS Linear to be modified by moving the curb inlet ‘on end’ of the system where it would span both the pre-treatment and discharge chamber of the system. To prevent some runoff from simply entering the curb inlet and going straight in to the discharge chamber (avoiding treatment), a DVERT trough was added over a portion of the inlet. This ensures 100% of the entering flow would be channeled to the pre-treatment chamber and get processed through the treatment stages of the system. In addition, the outflow pipe needed to be almost 8’ below finish surface due to existing utilities near the surface. The flexibility of the MWS Linear stands out in these challenging circumstances. Its horizontal flow biofiltration bed allows the system to be made 8’ deep and still have a vegetated planter. It’s the only biofilter available on the market that can be deep and still have an active vegetated planter bed. On the northwest end of the project was another, somewhat contrasting situation. Existing storm drain lines on that side of the project were very shallow and any BMP considered for the retrofit would also need to be equipped to accept shallow lines. Most BMPs would require additional trenching, but these limiting factors can be overcome with the MWS Linear. Within the limited space the MWS Linear could still be installed and maintain a treatment flow rate of over 85 gallons per minute and internally bypass the 100 year peak flow. Once again, the MWS Linear was capable of meeting the challenges due to its horizontal flow technology, which allows the system to treat the flow in less than half the amount of footprint of any other available biofilter – making it the only system that could fit within the available space. Finally, its three-chambered design allows the system to easily bypass the peak flow internally without having to increase the size of the unit. In short, the MWS Linear was able to meet all of the design challenges of a high treatment flow rate, shallow outlet pipe and internal bypass with ease because of its versatility. “With any other system you’d be forcing a square peg in a round hole. There is no way any other biofilter could have adapted to fit all the different variables”, exclaims John Hayden, Bio Clean’s Principal Engineer. The MWS Linear is a self-contained 3-stage system. Pre-treatment does the heavy lifting – collecting trash, debris and sediment giving maintenance crews a focused and easily accessible location for collection and cleanings. Both the Water Polisher and MWS Linear are equipped with built-in pre-treatment preventing clogging challenges found with typical downward flow media filters. The Cross Border Xpress is yet to open, but when it does, it will not only be equipped to successfully address the high demands of Southern California’s international traveler, but also its enduring stormwater pollution concerns. Horizontal Flow Biofiltration Explained: While most biofilters use little to no pre-treatment, the MWS Linear incorporates an advanced pre-treatment chamber that includes separation and pre-filter cartridges. In this chamber trash, sediment and hydrocarbons are removed from runoff before it enters the biofiltration chamber, in turn reducing maintenance costs and improving performance. In the main biofiltration chamber water flow is subsurface and surrounds the biofiltration bed via the patented perimeter void area then flows inward to the center vertically extending underdrains. This 3-dimensional design maximizes media surface area in a given footprint for advanced treatment capacity and provides 2 to 4 times more surface area than traditional downward flow bioretention systems.